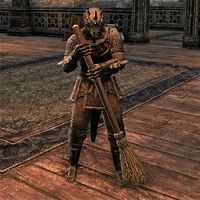 Dust-Foe is an Argonian laborer who works at the keep in Alcaire Castle. He's upstairs, living up to his name, keeping the castle spotless. He has no unique dialogue. This page was last modified on 19 May 2018, at 22:53.